The Houston Astros visit Angel Stadium on Friday to play the Los Angeles Angels. The probable starters are Mike Fiers for the Astros and Matt Shoemaker for the Angels. The opening line for this matchup has Houston at -101 and Los Angeles at -109. The over/under was set at 8. The Astros have a 23-19-5 over/under record and a 19-28-0 run line mark, meaning they cover 40% of the time. 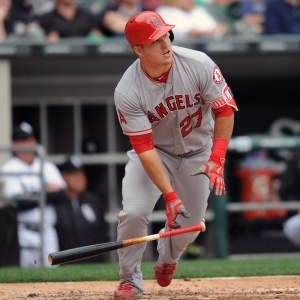 The Angels are 22-26-0 against the run line and have a 20-25-3 over/under record. They cover the spread 46% of the time. The Astros head into this matchup with a 19-28 record, including 7-15 on the road. Starting pitcher Mike Fiers has a 3-2 record with an earned run average of 4.35 and a WHIP of 1.26. He has 37 strikeouts over his 51.2 innings pitched and he has given up 58 hits so far this season. He has allowed 10.1 hits per 9 innings and he has a FIP of 4.39. The bullpen this year has an earned run average of 3.53 and they have given up 142 base hits on the year. Teams are hitting .230 against the bullpen while being struck out 180 times and walking 35 times this season. As a team, Houston has allowed 9.42 hits per nine innings while striking out 8.14 batters per nine. They are 23rd in the league in team earned run average at 4.42. The Astros pitchers have collectively given up 448 base hits and 210 earned runs. They have allowed 52 home runs this season and they allow 1.1 homers per nine innings as a staff. Houston as a pitching staff has walked 123 batters and struck out 387. They walk 2.6 men per 9 innings while striking out 8.1 per 9. They have a team WHIP of 1.33 and their FIP as a unit is 3.77. As a team, Houston is batting .229, good for 28th in the league while putting together a .231 average away from home. The Astros hold a .402 team slugging percentage and an on-base percentage of .309 which is good for 23rd in baseball. They rank 26th in baseball with 7.74 hits per game. Jose Altuve comes into this game hitting .312 and his on-base percentage is at .398. He has 58 hits this season along with 39 runs scored and 27 runs batted in. He's struck out 21 times and has walked 25 times. Carlos Correa is hitting .250 and he has an on-base percentage of .341. He has totaled 45 hits so far while scoring 22 runs and he's driven in 21. He has walked 23 times and has struck out 51 times. The Astros have 364 hits, including 91 doubles and 59 home runs. They've stolen 39 bases while they've been thrown out stealing 15 times. Houston has walked 179 times this season and they've struck out 463 times as a unit. They've left 319 men on base and have a team OPS of .711. They score 4.02 runs per contest and have scored a total of 189 runs so far this year. Los Angeles comes into this matchup with a 9-14 home record and a 21-26 overall mark. With an earned run average of 6.81, Matt Shoemaker has a 2-5 record and a 1.57 WHIP. He has 34 strikeouts over the 37 innings he's pitched during which he has given up 45 hits. He has allowed 10.9 hits per nine innings and his FIP stands at 4.77. So far this season the bullpen has an earned run average of 3.81 and they have given up 144 base hits on the year. Teams are hitting .239 against the Angels bullpen while being struck out 127 times and walking 58 times this season. As a team, Los Angeles has allowed 7.17 hits per nine innings while striking out 8.86 batters per nine. They are 6th in the league in team earned run average at 3.51. The Angels pitchers as a team have surrendered 416 base knocks and 198 earned runs so far this season. They have given up 60 home runs this year and they give up 1.3 home runs per nine innings as a staff. Los Angeles as a staff has walked 149 hitters and struck out 336. They give up a walk 3.2 times per 9 innings while they strike out 7.3 per 9. Their team WHIP is 1.36 while their FIP as a staff is 4.54. As a team, they are batting .240, good for 20th in the league while putting together a .222 average at home. The Angels hold a .376 team slugging percentage and an on-base percentage of .313 which is good for 19th in baseball. They rank 18th in baseball with 8.23 hits per contest. Mike Trout comes into this matchup batting .318 and he has an OBP of .405. He has 56 hits this year along with 32 runs scored and 32 RBI. He's struck out 42 times and has walked on 27 occasions. Kole Calhoun is hitting .298 and he has an OBP of .371. He has collected 51 hits so far while he's scored 26 runs and drove in 22. He has earned a walk 18 times and has punched out 35 times. The Angels as a unit have 406 base hits, including 70 doubles and 39 homers. They have 14 stolen bases while they've been thrown out 13 times. Los Angeles as a team has walked 141 times this year and they have struck out 276 times. They've had 301 men left on base and have an OPS of .704. They score 4.09 runs per game and have totaled 192 runs so far this season.